At first read, they appear to be advancing an idea about which I am passionate. 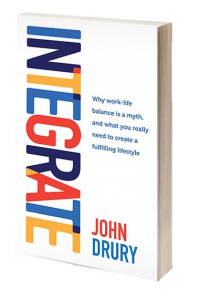 I wrote a book about it called ‘INTEGRATE – why work-life balance is a myth and what you really need to create a fulfilling lifestyle (John Drury 2016). Kindle version available on Amazon. Hard copy available here. As I read many of these articles, I see the writers have begun to understand that ‘work-life balance’ is an unhelpful concept. It implies we all should strive for an optimum point of balance between work and life. It pits work against life. It just does not help especially if you love your work. Some people are passionate about work. They see a deep connection between their purpose on earth and their work and want to make a difference in the world. These are people I like to call high achievers. The people for whom a scene in a movie can suddenly spark a business idea. They wake in the middle of the night with a solution to a problem they have thinking about for weeks. They are focused on business success, winning the next deal or completing a project. The plus side of this shifting understanding is that many workplaces are becoming more flexible. Employee value is being measured more by outcomes than hours spent at a desk or in an office. It used to be if a man asked for time away from the office to see his child play sport or attend a school assembly, he was regarded as lacking commitment to his career. Such a perception was detrimental to prospects for promotion. I am an advocate for companies to make workplaces and working hours more flexible. Being measured by what time you arrive or leave the office each day is one of those petty rules that is more about control than real productivity. Busy executives can stay better connected to their partner and children – the cost of busy lives on families is great. Some appropriate flexibility can make a huge difference. Greater sense of individual responsibility and control – high achievers feel respected and more able and motivated to contribute on their terms when it’s the results that are measured rather than being at the office early every day. Beware. ‘Work-life integration’ may be a trap. We are much better at switching off from our families, or from attending to our health, than we are from work. We can become totally absorbed in work. We gain significance from work. We aim to please people at work. We like the kudos and satisfaction we get from working hard and making a difference through our work. As I read the increasing number of articles praising the concept of ‘work-life integration’, I am seeing some danger signals. My hunch is that ‘work-life integration’ is becoming an excuse for normalising a lifestyle in which we allow work to enter and dominate every part of our lives. Work can trump every other person in our world and every part of our lives. “Oh sorry, I have to stay home and do this; I have to answer this email; I have to finish this research; it’s for work.” The unspoken message: It’s more important than you and whatever else I could be doing, because it’s work. And if I don’t get it done, it plays on my mind and I will find it hard to sleep tonight. My philosophy is that I work to live. I do not live to work. I have learned (very slowly and with much pain) to be ready to gladly leave an important work project unfinished to make time to be fully present for my wife and family. I want to create a lifestyle where my wife and I better integrate work with all that is important in our lives. To do that we must have other things than work in our lives Things in which we can become totally absorbed and in which we find meaning and purpose. What does a healthy and fulfilled life look like? The answers lie in having regular activities in your life which are at least as important to you as work. A self-test is to ask yourself the question: “In what activities can I become totally absorbed and lose all track of time?” If there are none, other than work, I suggest you have a problem. This means you have allowed your passion for work to dominate your whole life. For me these activities include: 5 hours playing cricket every Saturday afternoon in summer, playing with my grand-kids, always having a good novel on the go, and a week off near the beach once a quarter. This is a self-leadership issue. If work has become dominant there is usually another driver on the inside of you that needs attention. It may be an unhealthy driver. It could be insecurity. It could be a need to prove yourself to you, to others, or to a parent figure. It could be a search for identity. Passion is a great thing in life. However, unbridled passion can be a tough task master. As much as I like the word, INTEGRATE, I do not like the term ‘work-life integration’. For me it is just a variation on ‘work-life balance’. Work is part of your life. It is not separate to your life. The self-leadership challenge is to find a way to INTEGRATE your work with ALL that is precious in your world. This usually means with your partner, children, parents, wider family and friends, your health, emotional well-being (or mental health), your financial health and wealth creation, your physical surrounds (i.e. your home), your leisure and recreation, and your personal and spiritual growth. To live a fulfilling life, you need to be making appropriate progress in each of these key areas of your life. If passion for any one area becomes dominant for too long, things will dis-INTEGRATE. You will struggle to find fulfilment. This process is never neat or exact. Life is messy, and we often lose perspective. There will be seasons when some areas of your life take precedence. Starting a business takes all the energy and time (and money) you have for a year or two. The early years of family life require lots of commitment and focus and are all consuming. The latter years of your parents’ lives can require lots from you as well. Life is often full on and can serve up some unexpected challenges. We all have much higher lifestyle aspirations than our grandparent’s generation. There is great benefit in having an over-arching framework and a process which enables you to regularly (say every 90 days) to regain perspective. To integrate well requires discipline and focus. And it starts with healthy self-respect. That is the thesis and the process I lay out in my book, INTEGRATE.